You must be a member of the Rio de Janeiro Singles Connect Group to attend this activity. Would you like to join this group? 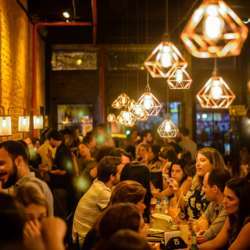 Let's meet to get to know each other at Coordenadas Bar in Botafogo! They have special beers, creative drinks, delicious appetizers and a relaxed atmosphere. They also have a Dj in the 2nd floor after 10:30 pm playing rock, pop, black and Brazilian popular music (MPB). The entrance is free until 9 pm, after this time it costs R$ 15.00 for InterNations members (normal price is R$ 20.00). We've reserved a table for us. Hope to see you there!